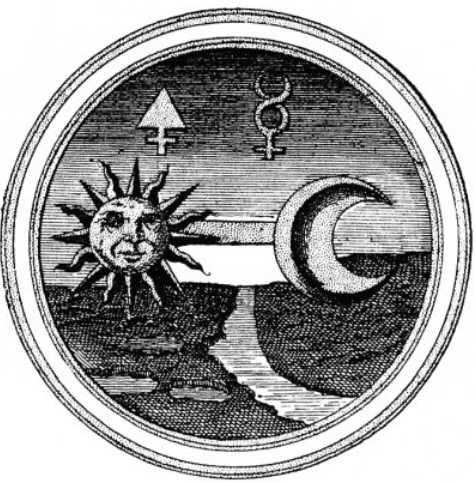 When the Sun and the Moon are viewed within the arena of Western esoteric traditions, including alchemy and the Tarot, they represent opposites that approach and retreat from each other even though they are destined to be merged into one. In these traditions, the Sun represents fire, masculine, positive (polarity), rational, visible world, and the consciousness mind. The Moon represents water, feminine, negative (polarity), intuition, hidden world, and the unconscious mind. 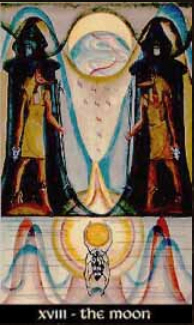 It is said that the enlightened being, often called The Wonder Child or viewed as the Philosopher’s Stone, is born from the merging of these apparent father/mother, king/queen opposites as depicted in the old art work shown here. I like the description of the Moon and Sun cards in the ancient quests of knights for the Holy Grail. The Moon, then, is the Grail in the lake (beautiful water symbolism here) and the Sun represents the Grail lifted up into the pure light prior to completing the quest. Afterwards, the initiate/seeker reaches “20 Aeon” which is viewed as the rising of the Phoenix from the ashes prior to ascension. There are multiple layers of symbols here when we overlay the hero’s/heroine’s journey paths with all their traditional associations, including the Lesser Mysteries and Greater Mysteries, the cycles of the seasons around “the wheel of the year,” the Tree of Life, Tarot, alchemy and astrology. One need not study all of this, or even any of this, to understand seeker’s journey. The journey is who we are and what we are about. All of the paths to enlightenment are pointed toward the same end: transformation. Each of us focuses on the symbols we’re most comfortable with and attuned to. Some experts say that we’re impacted by these symbols even if we are not consciously aware of them or understand the little we may have heard about them. I am a novice in using Tarot and understanding the cards’ many connections to the Tree of Life, spiritual alchemy and the cycles of the seasons. Generally, though, I like the symbolism of the Thoth Deck of Cards. 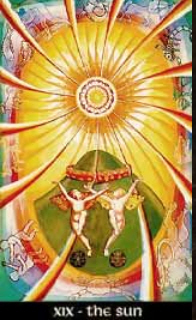 The Moon and Sun cards shown here are from that deck and have a fair amount of symbolism. Moon: The overall tone here is night. In the Book of Thoth, the Moon is called the “Gateway of Resurrection.” During night and Winter, the waiting Sun is diminished or absent. The landscape here is severe and the stream is mixed with blood. The sacred scarab holds the sun in its darkness while the moon occupies the mind and cosmos. Sun: The overall tone here is light, with the twelve major rays standing for the signs of the zodiac. The light emanates from a rose-like sun, standing for the flowering of the solar influence. The children above the green and fertile earth are forever young and innocent. They represent the seeker’s and/or humankind’s next stage. As a writer, I love the relationship of symbols and story ideas. They can strongly impact plots, themes and characters. There are many ways to characterize a journey. For example, readers of my hero’s journey novel The Sun Singer will find numerous references to light and the other aspects of the so-called solar journey. For more information, see the Journey Page on my website and explore the information on the Joseph Campbell Foundation site. The book’s Glacier Park setting reminds park visitors and fans of “Going to the Sun Road” and the expanse of light one sees from high mountain trails. For more information about Tarot cards in general, you might enjoy exploring one of my favorite sites: Raven’s Tarot Site. Here you’ll learn more about the Major Arcana (trumps), Minor Arcana (suits), and their correspondences with the Tree of Life, the classic elements, and astrology. My first intention in both of these books is telling an exciting story. Both stories have many associations with myths and symbols. Those who know the myths and symbols will, perhaps, smile when they see the references. Those who do not consciously know the myths and symbols will still be subject to their spells. As Rumi said, “What you seek, seeks you.” So, perhaps when you’ve finished reading the stories, you’ll be drawn into the “inner stories” behind the actions of Robert Adams (The Sun Singer) and Sarabande (Sarabande). When that happens, you’ll find that what you are looking for will begin to appear more often in your life in the form of books, websites and links, things you see on the way to work or on a hike, people who are interested in these subjects, and your dreams. Meanwhile, as you read the novels, I hope you’ll enjoy the action while you are dancing with the Sun and the Moon—as they dance with each other. I have several Tarot decks–have had, at any rate–but my Thoth deck is my favorite, and the only one I use. It is truly a beautiful deck. Ever since my immersion in the Kings River this past summer, I have been drawn to water in a way I’ve never before experienced. I’ve been trying to read up on why that may be; why, spiritually, this mountain girl is now more drawn to the sea. Maybe I should consult my deck for some ideas. The Thoth Deck is exceptionally beautiful. Each card can become the focus of a self-guided meditation. Oddly enough, part of my attraction of late to North Florida stories came after my work on “Sarabande” attuned me more toward water, something one finds in abundance in a Panhandle world of beaches and rivers. I can see how jumping in that mountain river can be part of your search. It was more like I was pushed into that water! Muse was being very insistent and bossy that trip. Normally, I avoid getting my hands and arms wet in icy mountain water, because cold triggers bad neuropathy attacks. But it didn’t that day, nor did it the following month when I again took a dive into an icy mountain creek. That in itself told me something about pursuing my water side. Nothing like a pushy muse. Looks like you’re going to have some interesting experiences with water, maybe some to post about, and perhaps others to merge into some poetry and stories. I’m guessing your journal is already hearing your stories. Will your next book be The Wonder Child? Thanks! In a way, yes. You’ll probably find references to Taliesin and to the Aeon card.